Even before newly appointed Ombudsman Conchita Carpio-Morales could step in her new office, anti-corruption advocates already have an important assignment for the new chief of the anti-corruption body. A day after the 2nd State of the Nation Address (SONA) of President Benigno Simeon Aquino, Akbayan Party Spokesperson Risa Hontiveros, former Brigadier General Danilo Lim and social activist Jimmy Regalario filed plunder and malversation charges against former president and now Pampanga Rep. Gloria Macapagal Arroyo (GMA) and several others concerning their alleged misuse of P325-million intelligence funds of the Philippine Charity Sweepstakes Office (PCSO). They said the prosecution of Arroyo and other “utak wangwangs” is the first important undertaking Carpio-Morales must accomplish. “We warmly receive the appointment of Carpio-Morales as the new ombudsman. I hope she doesn’t mind that even as we welcome her appointment we already filed this case. Alam namin naghahanda pa lamang ang bagong tanodbayan but I hope she understands that the momentum to pursue all plunderers including Gloria must be sustained. We are confident that the new ombudsman is with us on this matter,” Hontiveros said. Hontiveros also said they are seeking the life sentence for Arroyo. The complaint used evidence culled from senate hearings investigating the unwarranted use of PCSO intelligence funds to charge Arroyo, former Executive Secretary Eduardo Ermita, former PCSO Vice-Chair and General Manager Rosario Uriarte, the former members of the PCSO Board of Directors Sergio Valencia, Jose R. Taruc V, Raymundo T. Roquero, and Ma. Fatima A.S. Valdes and Manuel Morato, and former Commission on Audit (COA) Chair Reynaldo Villar with malversation of public funds, violation of the anti-graft and corrupt practices act, and plunder. “The evidence is very strong in this case that Gloria has abused public office to amass wealth. She led the creation of intelligence funds that are beyond the mandate of the PCSO, and she authorized the anomalous disbursement of millions of charity money through this fund, with the paper trail largely inconsistent or incomplete,” Hontiveros explained. “Ninakawan ba ni Gloria ang sambayanang Pilipino? Hindi ka na maaring magkamali pa sa kasong ito, oo nagnakaw si Gloria,” Hontiveros added. “Tulad na rin ng sabi ni Presidente Aquino, tapos na ang mga maliligayang araw ng mga utak-wangwang. The anti-corruption momentum is strong. We have replaced Arroyo’s gatekeeper at the ombudsman’s office with a new ombudsman with strong moral character and expertise. Left and right whistle blowers are revealing their damning accounts of grand-scale corruption in the previous administration. And finally, we have a case that will call GMA to account for morally-bankrupt leadership and plunder,” Hontiveros concluded. AS A QUEZON City court announces today its long delayed verdict on the “illegal assembly” case slapped more than five years ago against an APL leader, the Alliance of Progressive Labor reiterated its call for the Aquino government to actively prosecute Gloria Macapagal-Arroyo and her accomplices not only for large-scale corruption but widespread human rights violations also during her nearly 10-year rule. The Metropolitan Trial Court Branch 43, after an agonizingly slow deliberation of the case, will finally state this morning whether or not Josua Mata, APL secretary general, is guilty of the charges filed against him by government lawyers in 2006. APL activists will picket near the MTC Branch 43 at the Justice Hall inside the Quezon City Hall compound to underscore the need for the court to formally junk the absurd and “purely harassment” case, and instead punish those who suppressed democratic rights and made a mockery of justice. 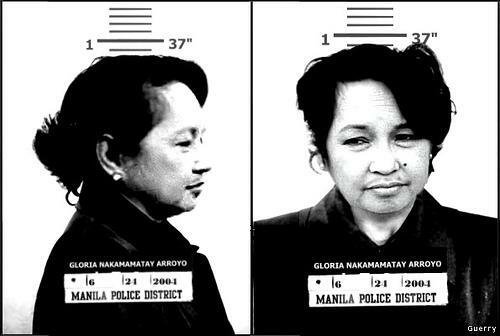 Mata was among the 13 nabbed by the police in the vicinity of Welcome Rotonda while marching towards Manila to celebrate the International Women’s Day (IWD) in that fateful March 8 as well as to denounce the rampant irregularities and the increasing use of repressive measures by the Arroyo regime. These “repressive measures” were in fact invoked by the police in their treacherous, unprovoked and brutal dispersal and arrests in the said peaceful march of a few hundred protesters, mainly women activists, trade unionists and advocates, the APL recalled. At least 15 were reportedly injured, three seriously, and 11 of them females, including some elderly women. All the 13 seized by the police were roughly handled. For instance, Mata was beaten with a truncheon by an anti-riot police, badmouthed and forcibly dragged into an unmarked car by plainclothes officers. Authorities defended their unwarranted move by citing the alleged illegal assembly of the marchers as specified in the conveniently resurrected Batas Pambansa No. 880 or The Public Assembly Act of 1985 – crafted by the Marcos dictatorship to curtail anti-government mass actions. Aside from BP 880, the authorities likewise invoked the supposed calibrated preemptive response policy, including the so-called “no permit, no rally,” that was enforced by Arroyo on Sept. 21, 2005 (ironically during the 33rd anniversary of martial law) to further restrict the growing anti-Arroyo mobilizations. As if these were not enough, on Feb. 24 or two weeks before that IWD dispersal and arrests, Arroyo declared a “state of national emergency” through another draconian decree, the Presidential Proclamation No. 1017 and its implementing law, General Order No. 5, which put the country under virtual martial law and effectively curb many civil and democratic rights of the citizens. In fact, the CPR, the revived BP 880, the PP 1017 and G.O. 5 were hastily imposed to save the crumbling Arroyo regime from the rising protest movement of the people who were tired and disgusted of unending and big-time government anomalies as well as the discovery in the “Hello Garci” tapes that Arroyo cheated in the 2004 presidential polls. But because of the extensive protests inside the country and abroad against the emerging authoritarian rule of Arroyo, the PP 1017 was lifted after a week. Still, even in a short period, many suffered from arbitrary arrests and imprisonment, violent breaking up of rallies, Gestapo-like raids, including in an “opposition” newspaper, among others. APL also reminded the resurgence of the atmosphere of impunity during the Arroyo regime, especially the series of political killings, abductions and harassment of activists, journalists and whistle-blowers, and capped by the gruesome Maguindanao massacre in 2009. The APL is likewise calling the current government to totally repeal other existing anti-democratic laws that restrain, for example, the freedom of expression and assembly, like the Marcos-era BP 880.